Metal Diaphragm vibrating at an Ultrasonic Frequency creates water droplets in the form of cool fog. Absorbed by air quickly. When droplet's size is bigger it can settle directly over the metal parts of machinery without proper dispersion in air resulting in corrosion of parts. Cost of humidifying is as low as 0.05 kw/kg/hr which is 1/10 to 1/15th of other humidifying types. This technology doesn’t need nozzles . 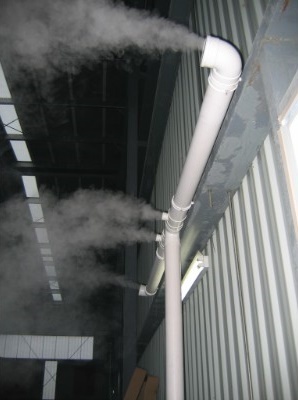 Fog output can be direct from the PVC pipe thus no issue such as nozzle blockage. 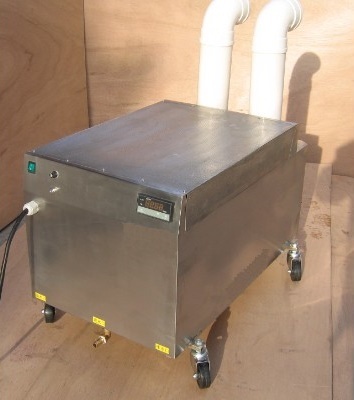 Advanced automation technology , unique water proof design , easy cleaning and long life span making its usage reliable. Humidifier works without mechanical drive .Large power Motor and Compressed air makes it's maintenance easy and economical. Assembling in any type of area easy as it is very compact in size.